I am very late in writing this post and I have to apologise to Mr Dispenser for being so tardy, but I just wanted to let you know about a fantastic book about pharmacy that has just come out. This book was written by Mr Dispenser, who is, if you read his book clearly not your average pharmacist as in his spare time (!!!) he has been collecting funny anecdotes from pharmacists around the UK (and I suspect further afield) as well as documenting his own experiences of pharmacy life. The book is called Pills, Thrills and Methadone Spills and you can download it as an e-book from Amazon or a paper back version. This book had me chuckling constantly (I have to admit mostly at the silly things patients say as I am often one of those patients). Also, for me this has been the most fun way to learn about pharmacy life and the things that might be on pharmacist’s minds – I love academic papers, but how nice to learn in such an engaging way. I have no doubt I will be referencing it in my thesis (especially the chapter titled “The missing prescription” – which is a lovely narrative of the mistakes that are made by several people at the same time and the devil that is confirmation bias). This isn’t a book aimed at academia (although for all those working in pharmacy practice research and teaching it is a fabulous resource) what Mr Dispenser has achieved through his blog, and now this fantastic book is a dialogue between pharmacists all around the world – and that is amazing. 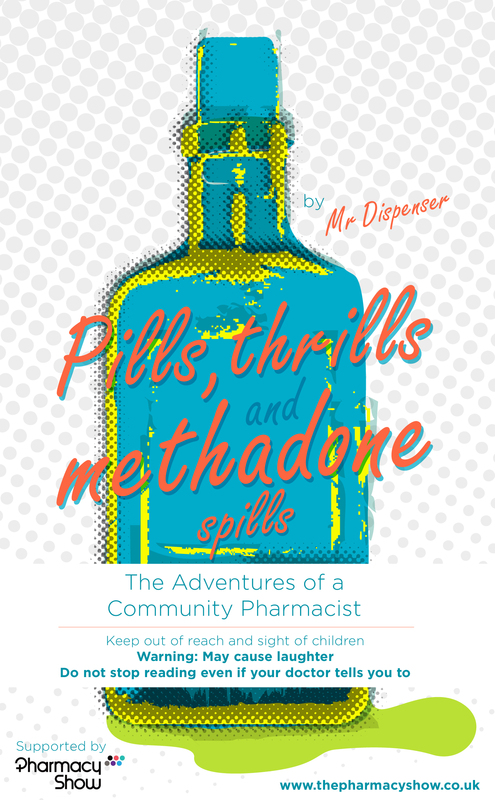 You can follow Mr Dispenser’s blog or on twitter:@mrdispenser for many more funny stories from the pharmacy world. Great job Mr D! One year and 2 months later…. 52 4th year MPharm students from the University of Bath took part. I am, as you can tell, relatively calm about this landmark moment in my PhD! Actually when you look at the stats above, that doesn’t look like that much for a years work but it feels like a lot more has been involved – and there has really – all the difficult to measure time spent on recruitment, posting out info, e-mailing and telephoning pharmacists and pharmacies. Jane – my very dedicated supervisor – I need several posts just to tell you how flipping wonderful she is. We have the best time ever working together, it is not work, it’s lots of giggles. We can be serious too though. Chris – who looks after our student dispensary – and for the last 2 years my research projects! My Office – I work in an office with about 9 other people (it varies from time to time) PhD students and Research Officers. Between them they have fielded phone calls for me and met participants when I have been with other participants in our student dispensary, which helpfully has no mobile phone reception, or easy-to-get to land-line. Without them, many participants may never have found me! Universities are such rabbit warrens – I still get lost and I’ve been here 4 years! So there you go, study 1 down! Study 2 and the follow-up study will be down before Christmas. Hooray! And now to leave my desk and head off for a celebratory dinner with Mr F! On Friday I found a great website called error diary which I wanted to share on here because I really love the idea behind it. The aim of this website is to get people talking about the everyday errors that we all make so that we can start to think about errors in a new way, instead of just beating ourselves up about them and not learning from them. I also thought it might be of interest to those lucky people who are taking part in our research, other pharmacists and anyone interested in this area of research. You can read all about the origins of error diary on the website, but from what I can gather it was created by some researchers at University College London – in particular, Dr Dominic Furniss. The website is supported by a grant from the EPSRC (the Engineering and Physical Sciences Research Council) – this same grant also supports a huge study called CHI+MED which is looking at human error in the context of healthcare professionals’ interactions with medical devices (e.g. medicine pumps). I should point out here that the pharmacy world is clearly aware of the work that the CHI+MED research team are carrying out because Prof Harold Thimbleby one of the members of the CHI+MED management team was presenting at the Royal Pharmaceutical Society Medicines Safety Symposium today in London. I am hoping this means that he will have inspired lots more research into human error and pharmacy systems. Errordiary.org also has a page dedicated to resilience strategies. Those things we do to help us avoid making the same error time and time again. I have developed quite a few resilience strategies whilst running our experiments, to stop me forgetting to do or say something. I have a script that I read from when I am briefing our participants (in fairness this is just best practice for anyone running experimental studies with human participants). I also have a post-it note with all the things I need to remember to do when running the study that sits on my computer desktop (on one of those electronic post-its that you can get on windows 7). It is very useful especially because I often run two participants at the same time which can open up lots of opportunities for errors to occur. One thing the errordiary website has inspired me to do is start noting down (with their permission) all the resilience strategies that my participants tell me about in their debrief. All those things they do on a day-to-day basis in their dispensary to avoid making an error – I am also going to write my own down as and when I notice them occurring. Now that I have found these great sites and the CHI+MED project, I am sure I will be writing more about their work in future posts. 17.06.2012 – A long overdue study update! I cannot believe it, the end of this week marked the end of my second year of my PhD. I am now officially a third (and hopefully final) year PhD student. The great news is, we are running to plan. 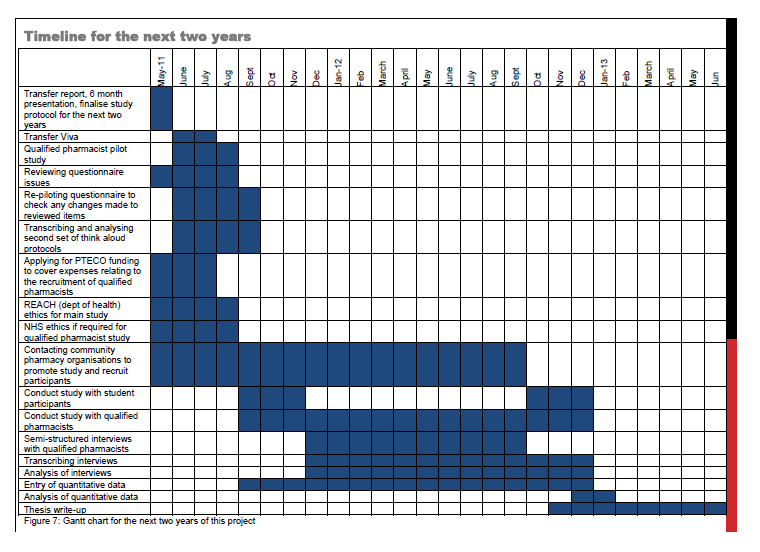 As you should be able to see from the Gantt chart above I have until December this year to finish my data collection. Thankfully, everything seems to be running pretty smoothly, as you can see in my updates below. Well the great news is that we have completed the first of the two planned studies with our pharmacy students at the University of Bath. I finally hit my target recruitment for study 1. It has taken me a good 9 months to get all the participants we needed, thankfully I completed the qualitative aspect months ago and all the data is ready and waiting to be analysed. So this week I am going to be looking at that as I have a week off from the Community Pharmacist study (more about that in the update below). In October when the students return, we will start the second study and hope that our recruitment is quicker this time round – with all that we have learnt from this first study about how to engage students in our research. The students who have taken part in our first study have been fantastic and they have given me lots of ideas, and plans for future research. So a huge thank you to all of them for all their help. Finishing this first study was a real boost for my motivation – the end is now in sight and it is just the icing on the top of the cake that I met so many students on my way to this first target. Things are starting to move pretty quickly now which is exciting. We have around 20 pharmacists from a range of community pharmacy settings (supermarket, national chain, independent, as well as some lovely locum pharmacists) signed up and booked in to take part so we are already roughly 1/5 of our way to our minimum recruitment figures (min 104 participants – max 130 participants). The rest are slowly but surely coming in and we are starting to experience a snow-ball effect where the participants we have already met are recommending our project to their colleagues. I will take this opportunity to say thank you so much to those pharmacists who are recommending our study – we really appreciate your support. Unlike the pharmacy student participants, our community pharmacist participants need a little more notice to either organise locum cover, or find a day when they can come in, and so I have just begun to meet my first few participants in the last few weeks. So far so good, the testing is going well and our first few participants have reported that they enjoyed the study and see the applications of the theory underlying these studies and our plans for the future as important for their profession which is more than encouraging. It has now been about six weeks since I sent out the first round of invitations to pharmacists to invite them to take part (before that we spent a few weeks contacting pharmacy organisations asking for their permission to carry out the research with their pharmacists). The standard protocol is to do three mail shots, so after this we have one more mail-shot to do (in about another 6 weeks time). I will also be following this mail-shot up with phone-calls to pharmacies over the coming weeks, to aid recruitment. Anyway, Jane and I spent almost 2 whole days preparing information packs for our second round of invitations to pharmacists to take part in the study. I am so grateful to Jane, like all lecturers she is stupidly busy, but she still finds time to help me out stuffing envelopes. One of the big upcoming events in this project’s diary is our Project Management Group meeting which is next Monday 25th June, which I am both nervous and excited for. It’s like having a mini viva (viva: the oral exam which all PhD students have to pass to receive their PhD) every time we meet with our PMG. All the members are incredibly knowledgeable and very important in the Pharmacy world and so it is important to me that I can show them what a great job that Jane, Marjorie and I have been doing since we last met. In July we will submit our interim report to our funders so the meeting is in preparation for this. As if I didn’t have enough to do this week, this is the week that our bathroom is being renovated. This is the first major thing we have done to our home and I am very nervous that there is something we haven’t considered or planned for. Purposefully, I have not planned to meet any participants this week, as I know that tomorrow when our bathroom is ripped out I am going to be a bag of nerves and won’t settle until it is all re-fitted and finished! A nervous researcher is not ideal especially when running experiments because the experimenter can consciously or unconsciously have a large effect on participants behaviour. I always aim to be calm, collected and approachable. If any of my family or friends are reading this last line I know they are now laughing because I am not well-known for being calm and collected, I am generally quite an excited, over-enthusiastic person! I promise to be back with another update soon! Back in February I got very excited and wrote a post about a 2-programme BBC Radio 4 series presented by Prof James Reason. I have finally had chance to catch up with the second part of this programme – even though it aired on 5th March! Yes I have been that busy. I like being busy though so I am most definitely not complaining. Before you read this, you may want to read my earlier post which introduces the programme. The second installment, I am sad to report did not include pharmacists amongst the healthcare professionals invited to talk on the programme. I had hoped it might, but it is only a 30 minute programme and they really were going for the heads of the big NHS /NHS related services so, it is not surprising. Despite the lack of pharmacy input into the programme, it was still very interesting and there were lots of points that could easily apply to pharmacy practice. Firstly Sir Liam Donaldson, Chairman of the National Patient Safety Agency commented on his own visit to the University of Michigan Health Centre who have been looking at the effects of an open policy to medical errors over the last decade (which was the focus of the previous episode of this programme). He said one thing he noticed that was very different was the training that was given to staff on how to talk to patients about the errors that had been made with their care. He also noted that the support that was provided to the patient and the family was much more than just an apology that they stayed without them throughout the whole process. In terms of our work into mental workload, the emphasis would definitely have to consider both how to train pharmacists to avoid errors, but also how to deal with them if they did happen (especially if they happened because of mental overload). Next, a representative from the National Reporting and Learning Service talked about how the approach to errors has changed in UK healthcare over the last few years. How she felt that the daily reports (e.g. before staff started their shift on a ward) had changed to include a focus on situations or patient issues that had the potential to lead to errors being made. Again this could easily be applied to pharmacy practice (this may be especially useful for locum pharmacists). By contrast Peter Walsh CEO of Action Against Medical accidents painted a much bleaker picture of our healthcare system today. He spoke about a case his organisation has been dealing with where the errors that had been made in a young man’s care was covered up. This young man died because of these errors, and at the time the family were made aware that some errors had been made but they were not given the full story and shockingly neither was the coroner. Peter Walsh said that cover-ups were still tolerated in our health system and that this needed to change. I agree with this, but for this to happen I think we need to implement Sir Donaldson’s observation that healthcare professionals need to be trained and supported in how to be open with patients when errors occur. For me, it is so exciting that these programmes have been aired in the last couple of months. Pharmacy is making a huge step at the moment to changing the safety culture and for that to happen the NHS needs to be making that step too, because ultimately the pharmacy profession works within the culture of the other healthcare services and systems in the UK. The fact that this is being talked about now, gives me hope that healthcare as a whole is moving towards this change in culture…but we shall see what happens. On Friday we received the ethics to run a competition whilst recruiting and testing participants. The competition is just for fun and to make this project a bit more interactive and help us to advertise the project. Hopefully it will take off! Anyway, now that the ethics has been received I can finally start advertising the competition – which will be called our blank brain competition. More details can be found out about it here (including what made us come up with this slightly bonkers idea). To get this competition kick started, as promised here is my very own completed blank brain as an example of the kinds of entries we are expecting. This is just everything that I am doing/thinking about today. Some of it uni related, some of it not. I have no idea whether this is a normal amount of thinking and doing! We shall see when we get some more entries. I am hoping I can persuade Jane and Marjorie to do their versions of their brains too! Whilst my brain looks busy and it is, often things aren’t too bad as our office is very orderly and not too noisy. For me, a busy day is when I don’t have time to think about food because I am too busy to notice that it is almost lunchtime!! Also as promised below are some fMRI images of my brain. By contrast to my completed blank brain, it doesn’t look like much is happening in my brain whilst it was being scanned! For those of you who aren’t familiar with fMRI, here is a quick description of what you can see. fMRI stands for Functional Magnetic Resonance Imaging. Often people will have MRIs – Magnetic Resonance Imaging of their brains, following a stroke because it is measuring certain properties of the blood flow in your brain (the idea being that the blood flow changes when regions of the brain are activated / in use). One has a functional MRI when they are put in an MRI scanner for a more prolonged period of time, and the activity in their brain is measured as they are doing different tasks. Where you can see different red and yellow splotches this represents activation in these areas of the brain – the gradient of colour (red through to yellow) tells you how much activation is occurring in that area. I would like to say this is what my brain looks like when I am doing a specific task, but really from my experience of this particular study I think this just relates to confusion, as I had to remember lots of very complex (and random) patterns and consciously I felt like I couldn’t distinguish between those I had seen before and those I hadn’t. So really what you are seeing is confusion – and probably a little bit of anxiety and irritation because the task was so hard! Good news! Things are looking up. Since my slightly downbeat, and overall nervous post a few days ago, about my concerns over the slow recruitment, I have had some more people sign up over the last few days and I am now much more hopeful that we will reach our first recruitment target in the next few weeks. By tomorrow I will have tested 33 participants and I have another 5 lined up. So only 14 more pharmacy students needed now! Phew! One thing I also didn’t mention in my last post, is that there are about 90 students in the 4th year of the Master of Pharmacy programme. My aim is to recruit 52 4th year students this year so I am trying to recruit over half of this group, which is a rather ambitious target for any research project. So when you think about it like that I actually have been very lucky to have so many enthusiastic pharmacy students take part already. So really my recruitment rate is quite healthy. Hooray! I will still keep willing the recruitment to go faster though as I cannot wait till I can run some analyses. Brian Goldman: Doctors make mistakes. Can we talk about that? Recently a video was uploaded to TED of a TED Talk given by Dr Brian Goldman (click here for the talk). Dr Goldman is an Emergency Room doctor in Toronto. His talk was about the consequences of doctors not being open about the errors they make. This video really complements the BBC radio 4 programme by Prof James Reason that I wrote about yesterday. The ideas covered are very similar, but Dr Goldman talks about his own errors and the experiences after it and what he wished he had done differently and how much he wished he could have spoken to someone about it. He gave a very moving talk about the errors he had made and demonstrated just how much emotion healthcare professionals feel when they make an error and how gut wrenchingly sorry they are when it happens. Which is probably why the University of Michigan reported a reduction in compensation costs for medical errors when a hospital switched to an open reporting culture. On Prof Reason’s radio programme patients talked about the importance of being able to talk afterwards to the doctors who had made an error with their care. The University of Michigan team also commented that when doctors were open and spoke to their patients about the errors made, this meant that litigation processes were stopped, or were never even started in the first place because patients didn’t feel like something unjust had been done to them once they spoke to the doctors. My thought after watching and listening to these two programmes was, is the reduction in compensation costs for medical errors in Michigan because patients get to see doctors and therefore can see how sorry the doctors are, can see that those emotions are authentic and that they weren’t taking the error lightly? You can judge for yourselves, I now have to go off and read all these University of Michigan reports as I have to find out more! One other thought I had after watching/listening to these programmes was that there is a lot of noise in healthcare at the moment about openness towards errors. What I am not sure about is whether this is something new, or I am only tuning in to it all at the moment because of the research I am doing, and because of talks within the pharmacy profession about creating a just culture (one aspect of a just culture is openness about errors). I clearly have to do some more reading of the literature to find out. Jane and I got very excited yesterday when we heard that Prof James Reason was talking on Radio 4 on Monday night about medical errors. 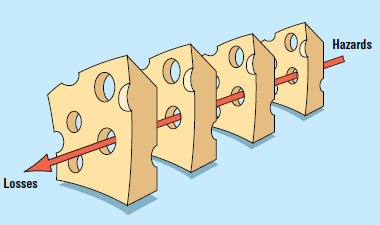 Prof Reason is most famous for his swiss cheese model (above), and when anyone talks about human factors research, or safety in organisations, his swiss cheese model is the first thing that springs to mind. He is that good and that famous! The radio programme called Dr – Tell Me the Truth is a two-part programme hosted by James Reason about medical errors. What I really enjoyed about yesterdays episode (the next one is on Monday 27th February 2012) was hearing from a range of stakeholders in medical errors. During the programme we heard from patients, researchers, clinicians and lawyers all relating their experiences of when errors had been brushed under the carpet and when clinicians had been open and up front that they had made an error. There was even an excerpt from a qualitative interview of a patient who had experienced a medical error in her cancer treatment and subsequently enrolled in a research project with the University of Michigan. In this excerpt you heard the patient say that she had the opportunity to talk to the clinicians that made the mistake and tell them how she was so cross at herself for not speaking out more in her consultations and not pushing until she got the response she needed. One of the clinicians there turned to her and said it wasn’t her fault (which obviously it wasn’t). The patient said when recalling this meeting that this simple experience made her feel listened to and not ignored and not like this error which was to have a huge impact on her life and health was not being swept under the carpet and ignored. This same theme was echoed again and again, where patients reported just being told that an error had been made, and being able to talk to the Doctor about it helped so much. The University Of Michigan had also been involved in lots of initiatives to create hospitals where doctors were completely open about errors. At first everyone was worried this would lead to more litigation, especially in cases where patients did not experience any ill effects of the error and did not know it had happened. However, what they found was the opposite that it actually dramatically reduced how much they were paying out in compensation for medical errors see here. Next week they will be hearing from Sir Liam Donaldson about whether the same principles could work for the NHS. Also from other healthcare professionals. I am hoping we hear from a pharmacist too in the next programme. There are so many professional groups in the NHS that it would be a shame (and biased) if they just talked about errors made by doctors. Jane and I were invited to the Royal Pharmaceutical Society (RPS) in London to attend a symposium about the responsible pharmacist regulations. It was organised by Martin Astbury (President of the RPS) and his colleagues and chaired by Catherine Duggan, Director of Professional Development and Support at the RPS. Both Jane and I were very excited to be invited and the day was even more interesting than the programme had promised. Originally billed as a discussion of the responsible pharmacist regulations it quickly led into discussions about the idea of developing a just culture in pharmacy. In proposing this idea Martin Astbury and Catherine Duggan are breaking new ground in pharmacy practice as discussions in the literature have focused on a more general definition of safety culture. They also invited representatives from other industries e.g. Sean Parker from the Civil Aviation Authority to talk about how the just culture works in the aviation industry. Sean spoke about how the aerospace industry has been working towards a “just culture” and about their successes and failures in terms of safety management. This was very exciting for Jane and I as our mental workload research is based on research from the aerospace industry and we feel that there is a lot of ideas and measures that can be applied in pharmacy practice. What a relief to know that we have been working along the correct lines the last couple of years and that the professional body as a whole is now also considering what can be learnt from this industry. For me, as a young researcher to be able to meet so many big names in the pharmacy practice world was very exciting. I have yet to perfect my networking skills so I was also very nervous the whole day, but the other conference delegates kindly listened to my ideas and thoughts when we broke up into small groups to discuss how a just culture could work for pharmacy. There were many great view points and it was clear that each sector of pharmacy perceived different barriers to the development of this culture. The overall biggest one was how pharmacy sits within the wider health care services, and is it possible for pharmacy to develop a new culture when they are also embedded in the culture of the NHS and their respective trusts, or communities? Overall for me, I was just thrilled to be invited to the very first discussion and meeting about this potential shift in pharmacy culture, especially as it fits so nicely with our research. There will be a lot more work and discussion within the profession before anything is decided or done, so I will keep updating this page with news and information as I get it. All work, unless otherwise referenced, is my own and should be quoted as such. Please do not replicate, distribute or use any part of my blog without contacting me (Hannah Family) first. Everything I write here is my own opinion and does not necessarily represent the opinions held by the University of Bath, my colleagues, collaborators, or the organisations funding this research or anyone else. All unattributed images and photographs are my own please let me know if you’d like to use them elsewhere. Ideas for brainy people by someone who minds.